United States (US) President Donald Trump and North Korean leader Kim Jong-un are ready to reunite for a second time. Speaking to Congress in his State of the Union address, Trump said that there is still “much work to be done” and said that both leaders will meet in Vietnam at the end of the month. "As part of a bold new diplomacy, we continue our historic push for peace on the Korean peninsula," Trump said in his speech. "Our hostages have come home, nuclear testing has stopped, and there has not been a missile launch in 15 months,” he continued. The meeting between the two leaders will take place on 27 and 28 February in Vietnam, which will also be part of Trump’s Asian tour. Trump is expected to meet Chinese leader Xi Jinping during his time in Asia. The choice of Vietnam as the venue for the next summit has surprised many, considering the government’s ideology and its war against American occupation in the 60s. Some are concerned that Vietnam may not be the neutral destination that Singapore was last June. However, all things considered Vietnam may be the perfect choice. It is close enough for Kim Jong-un – who prefers to travel by armoured train – to travel to. Also, while Vietnam and the US used to be enemies, both countries currently enjoy warm relations. More so recently, as Vietnam has been using its warm relations with the US to check China’s influence in the South China Sea. Vietnam and North Korea have always maintained good relations too. So, politically, Vietnam is neutral to both countries. Also, Vietnam is touted as the model for North Korea to follow should it decide to open up to the world. 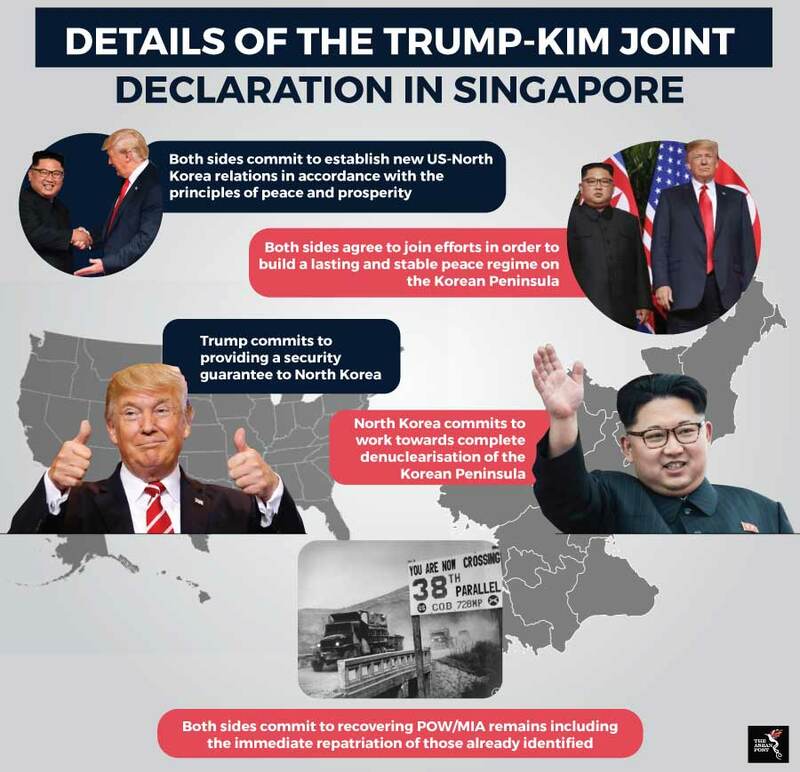 The first summit held in Singapore last June ended with both, Trump and Kim Jong-Un shaking hands and smiling happily in front of cameras. Both of them signed a declaration which outlined four basic goals; renewed US-Democratic People's Republic of Korea (DPRK) relations, the establishment of a “peace regime” on the peninsula, complete denuclearisation and the recovery of prisoners of wars. Ever since then, there have been some hiccups in nuclear talks between the two. In August, Trump cancelled Secretary of State Mike Pompeo’s visit citing insufficient progress on the denuclearisation of the Korean Peninsula. While in November after some progress was made and following North Korea’s affirmed commitment to denuclearisation, the Communist state suddenly threatened to return to its "byungjin" or parallel development policy of simultaneously focusing on its nuclear program and the economy citing that the US had not taken sufficient measures to address North Korean concerns, including the economic sanctions imposed on it. What to expect in Vietnam? What many observers hope to see is concrete agreements and measures that could lead to peace. One of the criticisms of the first summit was that, while the joint declaration was hopeful, it was worded vaguely and possibly led to confusion in the talks between North Korea and the US. The biggest talking point of the summit is of course denuclearisation. Many are sceptical that North Korea would be willing to completely denuclearise, given the US’ hesitation to end sanctions. Furthermore, to expect North Korea to completely denuclearise after 70 years of tension with the US is somewhat unrealistic. Kim Jong-un is not likely to agree to such a thing for security reasons too. Also, given Trump’s aggressive and nationalist approach, many do not think he will offer much concessions in that department either. Some experts suggest the best way to go about it is by offering step-by-step sanctions relief in exchange for concrete steps by Kim Jong-un to dismantle his nuclear program. The leverage is with North Korea as the main aim is to remove nuclear weapons from the region. This means it is on Trump to come up with a deal that is clear and airtight. Trump’s usual aggression will not likely work when it comes to seeking peace in the Korean peninsula. As South Korea’s Moon-Jae In has shown during the past year in his diplomacy with North Korea, it takes compromise and trust to build peace.